My property tax appeal was successful. My property taxes were officially lowered from $4,021.75 to $3,154.21 for 2013. This is still a big increase from my 2012 tax burden of $1,599.43, but it's a fair increase based on Multnomah's tax code. For others who are considering the fiscal impacts of an ADU to their current property tax, the important numbers to note in terms of possible tax increases are that my ADU cost ~$100K to build, it was valued at ~$90K by the county, and that this additional 'real market value improvement' increased my taxes by ~$1,500. 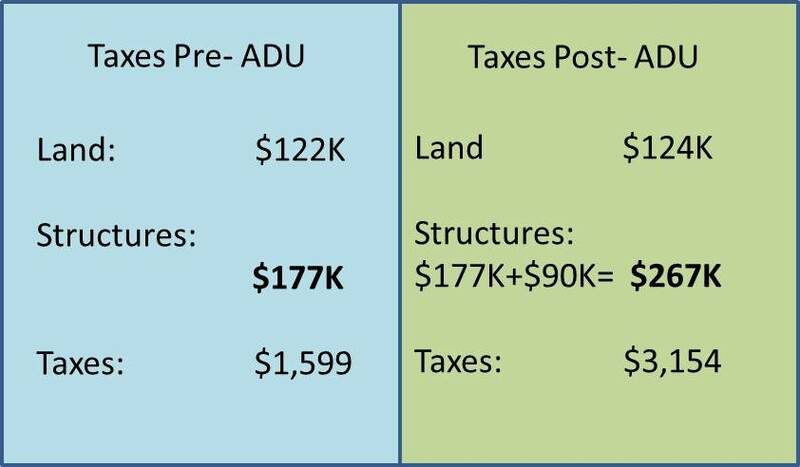 A property tax increase post-ADU, should be proportional to the contributory value of the improvements. Using my increased tax figures as a baseline, and assuming that I understand Multnomah tax code correctly, if an ADU adds between $50K-$150K of contributory 'real market value' to a property, the property taxes would go up proportionally from ~$850-$2,550/year. To figure out how an ADU may impact your property tax if you're in Multnomah County, simply multiply the assumed increase in assessed property value by 0.017. That will tell you approximately how much your taxes will increase after you've added an ADU to the property. And take my formula with a grain a salt be cause I am just a guy with extra time on his hands and MS Excel.